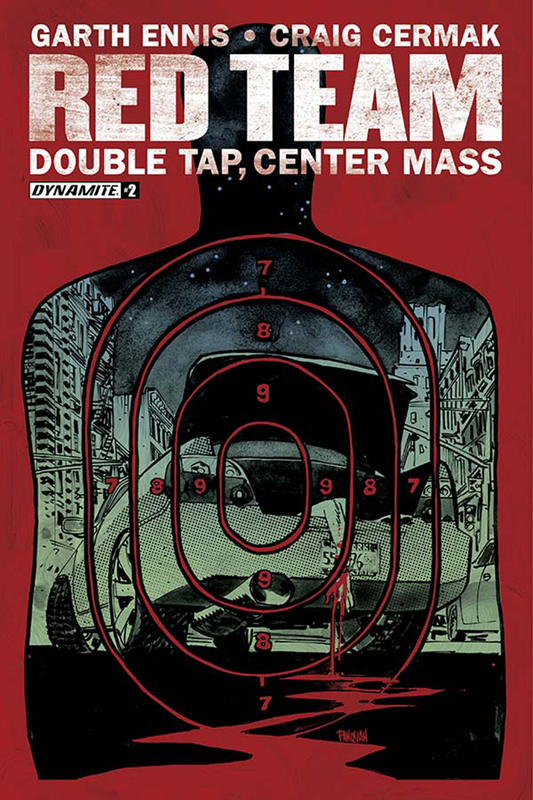 Red Team: Double Tap, Center Mass #2 Review – AiPT! Garth Ennis is writing a cop drama. That’s all the hook you need, but is it good? The first issue introduced the characters well and it was also highlighted by an intriguing crime involving a very white collar character. At the same time the heroes have a thing for each other and both are keeping it a secret. What’s not to love? Once again Ennis proves strong dialogue, perfectly timed character moments, and a high stakes plot can create an addictive story. Ennis includes just enough chemistry between the police officers to make you want to see if they’ll eventually see they want each other, but like in many great stories it’s the work that drives them. Quieter moments, like Eddie telling the perp’s friends off–and scaring them straight–or the bit of banter between Eddie and Trudy help infuse the story with character work and color. This issue also includes a fantastic interrogation scene that reveals a lot of what happened before the last issue even got started. The story is a clever one–something you haven’t seen on CSI, I’m sure, and it melds the two different sides of the train tracks together. Stakes are raised further when the police chief intervenes (god, are they all angry all the time), which ends up being a strong cliffhanger. The art by Craig Cermak (and colors by Vinicius Andrade) do well to capture the characters’ expressions and the subtle love interest between Eddie and Trudy. They’re also consistent from panel to panel and the TV drama vibe is always present due to good pacing. Save for two very dialogue-heavy scenes, this issue continues to deliver the cop drama goods. Around the quarter mark this scene slows things down to a crawl and somewhat seems to be here to recap new readers and help us remember what kind of stakes are in play. It’s done in one dump of information though, which kills the pace for a time. But his partner has brown hair…ohhhhh. If you read the last issue you’ll hop right into this drama and never want to look back. A slight hiccup slows things down, but this is good crime drama through and through.